The Jazz Age is in full swing, but Casiopea Tun is too busy cleaning the floors of her wealthy grandfather’s house to listen to any fast tunes. Nevertheless, she dreams of a life far from her dusty small town in southern Mexico. A life she can call her own. Yet this new life seems as distant as the stars, until the day she finds a curious wooden box in her grandfather’s room. She opens it—and accidentally frees the spirit of the Mayan god of death, who requests her help in recovering his throne from his treacherous brother. Failure will mean Casiopea’s demise, but success could make her dreams come true. In 1920s Mexico, Caseopea lived a very unhappy life cleaning floors of her wealthy grandfather and dreaming of a better life away from her chores. One day she comes across a mysterious wooden box and accidently frees the spirit of the Mayan god of death who takes her on a journey in hopes of regaining back his throne from his treacherous brother. Part Jane Eyre and part Cinderella story, Moreno-Garcia’s Gods of Jade and Shadow is a beautiful fantasy tale based on Mayan mythology. In a time with so much negative emphasis on Mexico, it’s easy to forget that Mexico is a country with a very rich heritage, mythology and folklore. Moreno-Garcia successfully retells this myth with a beautiful prose and description of a Mexico of the 1920s. I highly recommend this novel which is scheduled to be published in August 2019. I would like to thank Random House Publishing Group-Ballantine and NetGalley for providing me with a copy of this book in exchange for my honest review. 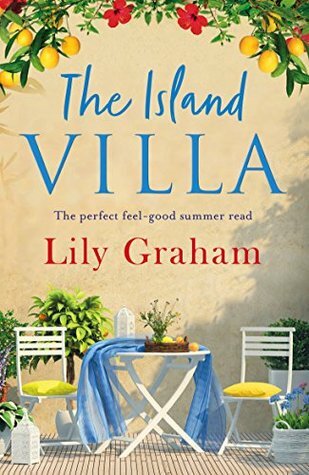 When Charlotte’s husband James tragically dies, he leaves her an unexpected gift – her grandmother’s beautiful villa, Marisal, on the Spanish island of Formentera. As she begins to explore her new home and heal her broken heart in the warm golden sunshine, Charlotte discovers that her grandmother Alba has been keeping secrets about her life on the island. Intrigued by her family’s hidden history, Charlotte uncovers a devastating love affair that put many lives at risk and two sisters torn apart by loss. Can the heartbreaking truth of the island’s dark history finally be laid to rest? Or will the secrets of the past shake the new life and love that Charlotte is close to finding? The book starts with Charlotte grieving her husband’s death and finding out that she has inherited a villa in the beautiful Spanish island of Formentera. The first part of the book started out slow and I thought the story was going to revolve around her grieving until she finds out that her grandmother Alba had some secrets Charlotte was about to discover. What attracted me to this book was the cover and the idea of reading a “feel-good summer read” and although the book was quite enjoyable, at times the narrative felt repetitive and stereotypical of what one thinks a Mediterranean island should look and smell like. Having lived in the Balearic Islands I thought a book about Formentera was going to transport me back to that time in my life, but it really didn’t. The historical part was very interesting, but overall I felt that the characters landed a bit flat on the pages and the middle of the story dragged a bit. It’s Mardi Gras season on the bayou, which means parades, pageantry, and gumbo galore. But when a flood upends life in the tiny town of Pelican, Louisiana—and deposits a body of a stranger behind the Crozat Plantation B&B—the celebration takes a decidedly dark turn. The citizens of Pelican are ready to Laissez les bon temps rouler—but there’s beaucoup bad blood on hand this Mardi Gras. Maggie Crozat is determined to give the stranger a name and find out why he was murdered. The story starts with a body that turns up behind the Crozat Plantation B&B at the same time that the town is preparing for their Mardi Gras celebrations and beauty pageant. Maggie Crozat’s grandmother usually deals with the Miss Pelican Mardi Gras Gumbo Queen pageant, but now she is sick in the hospital and left it to Maggie to coordinate the event. Maggie feels overwhelmed. She is not really a fan of beauty pageants and is determined to find out the identity of the body that turned up behind her family’s plantation. So, she starts a little investigation of her own. Her relationship with Bo, the official cop in Pelican, is rocky, her father is busy trying to win the Gumbo cookoff and when things seemed like they couldn’t get any worse, one of the judges at the beauty pageant is also found dead. Now Maggie and Bo have to rush against time to find out if these two murders are connected. What I think worked well in this novel was Byron’s wonderful characterization of the South. The descriptions of the people, the foods, the preparations for celebration–everything was so on point that it transported me back to Louisiana. I love New Orleans, and I really enjoyed learning more about that culture and the fact that although most people are familiar with the more over-the-top Mardi Gras celebrations in New Orleans, smaller towns in Louisiana celebrate what’s called Courir de Mardi Gras–which translates to “Fat Tuesday Run.” I really appreciated all the research she put in writing this story and all the bonus recipes at the end of the book. Mardi Gras Murder is book four of the Cajun Country Mystery series, but I was able to follow along fine–even though I haven’t read the other books in the series. This is a great cozy mystery! I read the entire book in one sitting, and I really enjoyed the ending. Now Bram has disappeared and so have Fiona’s children. As events spiral well beyond her control, Fiona will discover just how many lies her husband was weaving and how little they truly knew each other. Imagine you come back from a vacation, and you find that someone has moved into your house, except that your house was not for sale. This is how Our House by Louise Candlish starts. We are introduced to Fionna Lawson, aka Fi and her horror when she enters her house to find another family moving in and all of her furniture gone. Her children are nowhere to be found, and neither is her husband, Bram. The magic of this book was Candlish’s ability to take you on this ride with Fi as her life spirals out of control and the reader feels every bit of desperation that Fi feels. Is she insane? Is she dreaming? Is this some prank someone is pulling on her? The premise of the book is genius and you can’t help but keep on reading. What I enjoyed about this book was how the story was told from Fi’s perspective via a recording of the podcast The Victim, tweets that people posted based on Fi’s recorded story, and Bram’s word document explaining what had happened. I think this was an interesting, although not the first author to do it, way to tell a story. Unfortunately, I felt that the story dragged on and on towards the end. Although the ending was surprising, when it finally came it was not strong enough to pull the story through. I would like to thank Berkley Publishing Group and NetGalley for providing me a copy of this book in exchange for my honest review.